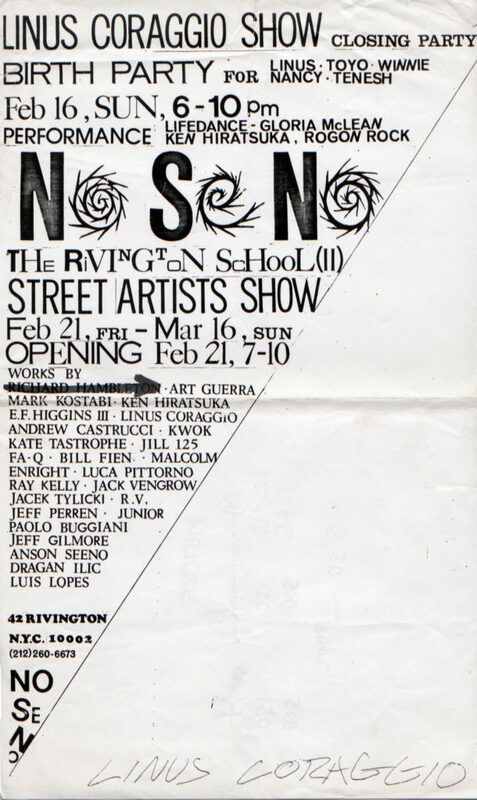 Photocopy flyer, signed by Linus Coraggio, 8 ½” x 14″. This show was a collaborative project that Toyo Tsuchiya curated. He installed 5 sheets of 9×12-foot canvas drop cloth around the entire No Se No interior and invited artists to complete the 60-foot canvas. Participating artists included Ken Hiratsuka, Art Guerra, Paolo Buggiani, Kwok Man Ho, Dragan Ilic, EF Higgins III, FA-Q, Jack Vengrow, “Cowboy” Ray, Kate Tastrophe, Anson Seeno, Jill125, Bill Fien, Andrew Castrucci, David Mora Catlett, Louis Lopes, Glenn Junior.